A lot of people don't examine their money stories - do you? As human beings, we like to create meaning with our experiences. Sometimes, these money stories are empowering and sometimes help instil beliefs that hold us back. 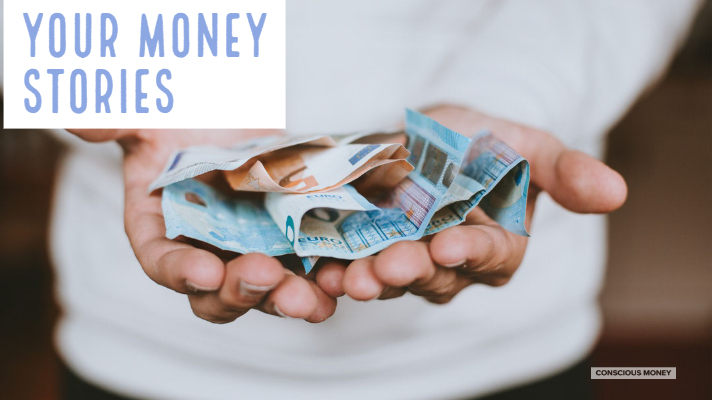 Questioning these stories and ideas, especially if they keep you stuck, frozen or disempowered is vital to having a conscious relationship with money. There are two aspects to money. Money is neutral. And yet, money is so many things because we need it to live our lives. The lack of it or the natural supply of it can trigger many emotions within us. Money is important too; it is one of the ways we meet our human needs for safety, security and ease in the world. One of the disempowering stories I have often heard (as an Independent Financial adviser privy to thousands of money conversations), is that I "just don't understand" money (or investments or tax planning) very well, so it has kept me from doing anything. One of my close friends is highly qualified technically, so knows about the stock markets, etc. , works in the financial services industry. He took two years to set up his pension at his workplace because he didn't understand the basics around pensions nor take the time to educate himself. So, this disempowering story isn't limited to people that 'don't know anything about money' - it, in my opinion, is a cross section of individuals. So, what stories are you telling yourself? Where are fear and anxiety holding you back from money? Can you take some steps, if you feel you would like to be more competent and take responsibility to be more financially literate? Could you pay a professional to help you with your blind spots? Paying attention to those stories and beliefs and examining those that don't serve you, will help you engage in a conscious relationship with money. This, in turn, will give you greater freedom and make you feel good about money. Money can be a great tool in understanding yourself better.